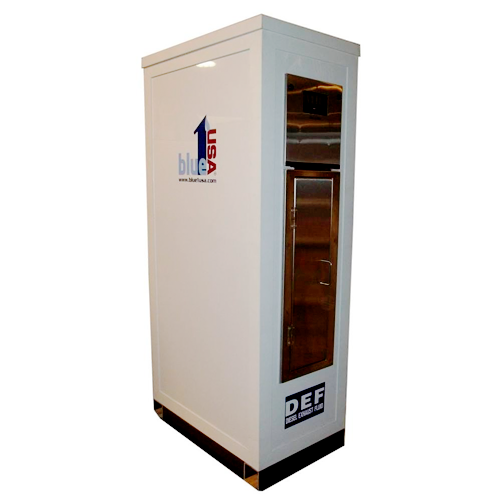 Blue1USA’s Mini-bulk systems for storage and dispensing are now considered the “World’s Best DEF Equipment” for many reasons. Our cutting-edge technology provides the widest range of solutions for fleet, retail, off-road and government installations with the most reliable product on the market today with literally thousands of systems installed and in operation in the United States, North America and around the world. The aesthetically pleasing glossy white exterior can be customized for warm weather or cold weather sites. Every sealed system is engineered to meet ISO 22241-3, 4 material standards and is pre-wired to conform to UL-508A and CSA C22.2 electrical specifications. Turn-key components include a robust submersible pump, filtered vent, dry-break fill coupler, audible overfill alarm, stainless steel press-fitted pipe and fittings and locking hinged roof. Our mini-bulk systems were designed and engineered to allow quick and easy installation and permitting for our customers. SECONDARY CONTAINMENT - Protect your property from spills and overfilling with an audible overfill alarm and secondary containment lining. NARROW, COMPACT FOOTPRINT - Our proprietary tank and system design results in the most compact footprint within the industry allowing for most convenient fuel island installation. 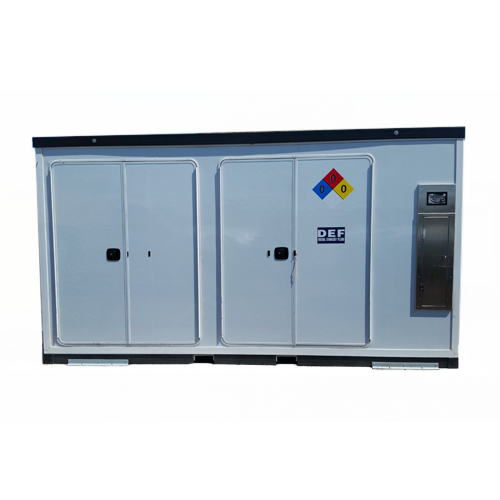 BROAD RANGE OF STORAGE CAPACITY - Sizes range from 500 to 5,000 gallons in all models to meet the needs of any size fleet or retail establishment. COMPOSITE MATERIAL EXTERIOR - Durable and robust material will not rust or corrode while providing many years of safe and productive usage. ADJUSTABLE LEVELING FRAMES - Utilizing our leveling frames instead of pouring new, expensive concrete pads means substantial savings for our customers. SECURITY & PEACE OF MIND. 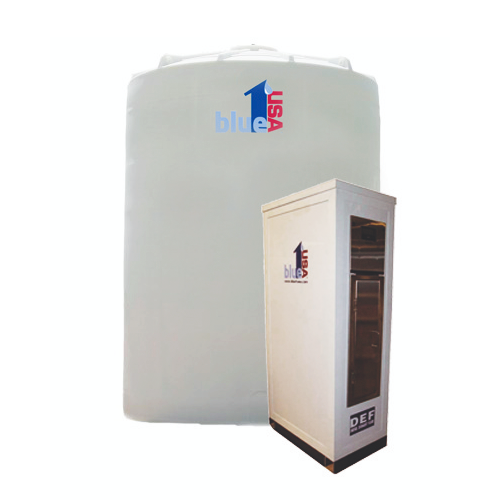 Both dispense and large door are lockable to prevent potential fluid theft. 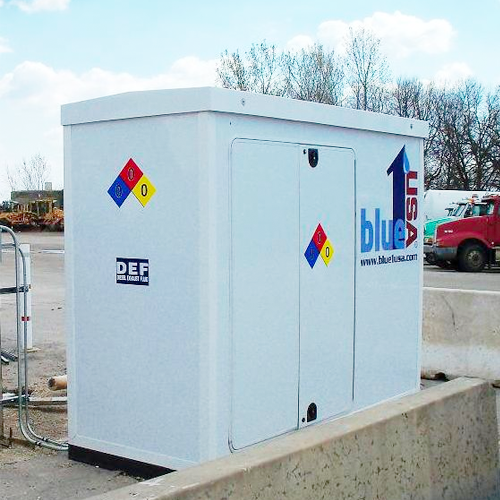 Our largest mini-bulk systems are engineered for large fleets and retail establishments who wish to minimize installation costs by keeping their DEF storage aboveground. These turn-key systems are not only aesthetically pleasing but are also built to withstand the heavy, demanding use by large fleets in all weather conditions. 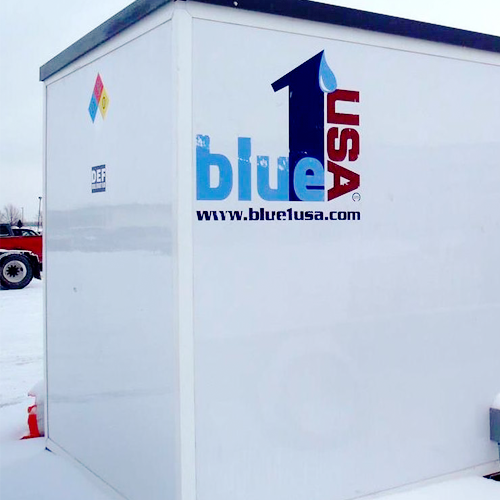 Available in 3,400 and 5,000 gallon capacities, the Blue1Max™ is available in either our remote or commercial model with the very popular built-in dispenser. 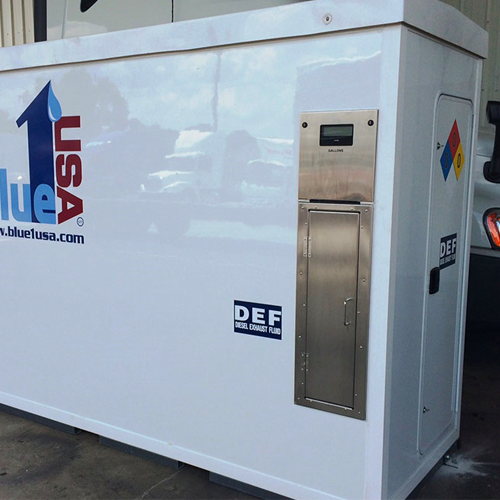 For users looking for the most economical storage for bulk DEF deliveries, Blue1USA can provide vertical tank solutions from 1,000 gallons all the way up to 10,500 gallons. 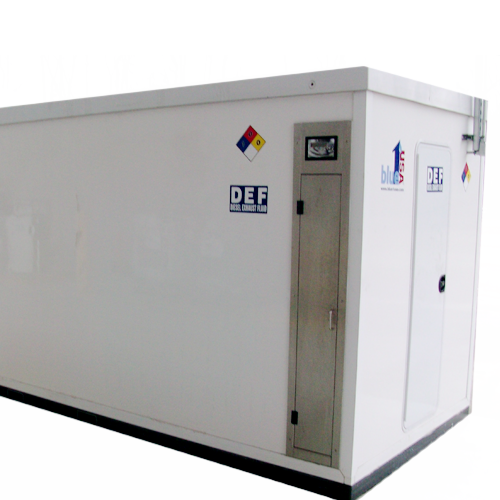 These tanks can be combined with our DEF dispensers and insulation package to create a complete turn key solution. Aesthetically pleasing design is engineered for both heavy-duty commercial use and resale applications. Dispensers are compatible with all major card reader systems and can be piped to any remote DEF tank or mini-bulk system. FACTORY INSTALLED COMPONENTS - Includes 20’ hose reel assembly, 1 micron filter, automatic shutoff nozzle, swivel/breakaway, pulse output and built-in mis-fill prevention device. STAINLESS STEEL DISPENSE DOOR WITH LED DISPLAY - Rugged cabinet prevents rust and corrosion while spring loaded door prevents freezing hoses winter. 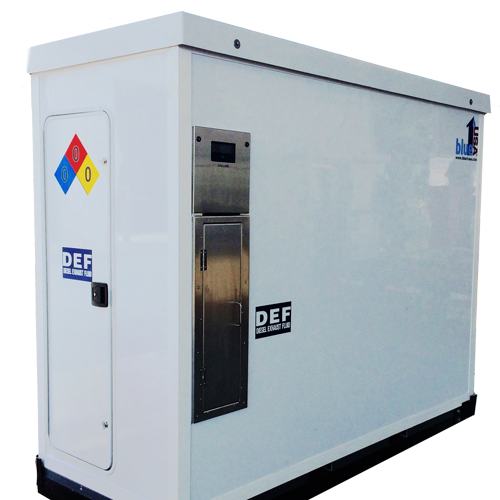 MANY OPTIONS TO MAXIMIZE PROTECTION - Thermostatically controlled heater, hose reel with 40′ hose, Weights & Measures upgrade, NTEP certified dispenserChoose from 40’ hose, thermostatically controlled heater, dual dispenser doors and Weights & Measures upgrade. Weights & measures upgrade. NTEP certified dispenser.